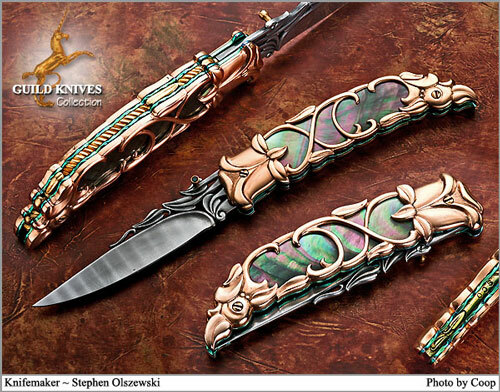 You could wait for 2 years for Olszewski to make you a knife like this, or you can invest in one now. Scads of 18K Gold! Look at that back spine of solid Gold, all sculpted and fileworked. Now, follow the interlocking Gold scrolls and study the Presentation Grade Black Lip MOP below the Baroque curves and vines. Next: the blade is of extremely well carved Rados ladder pattern Damascus, and you open it with an Emerald cabochon set in Gold. This window pane knife is a treasure to behold and one rather similar can be seen on page 77 of David Daromâ€™s book THE GREAT COLLECTIONS.